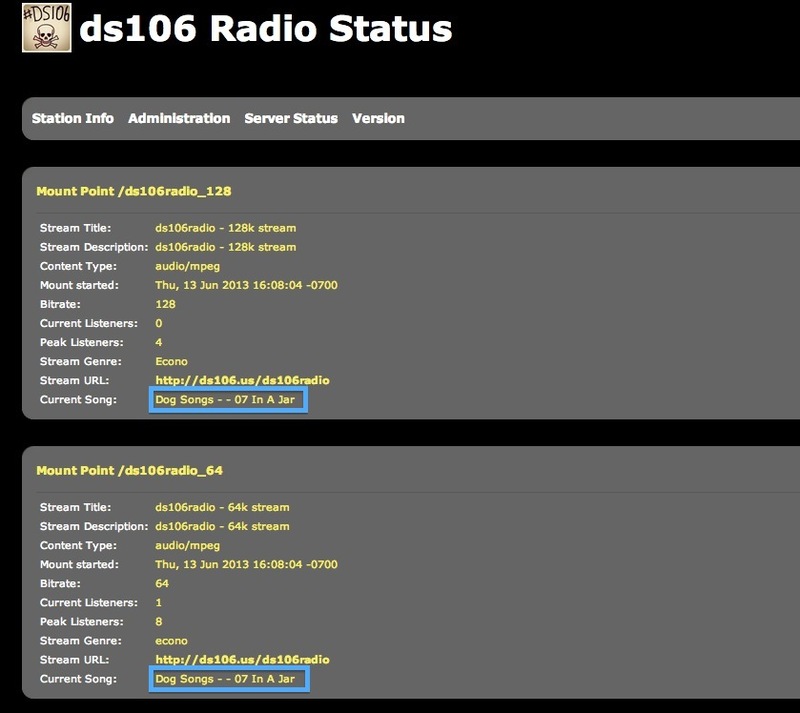 DS106 radio is coming up on its 4th birthday in February. 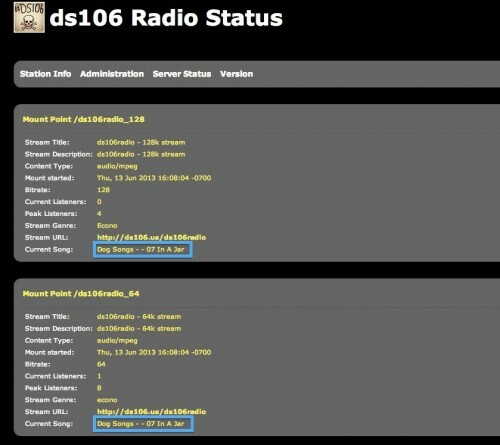 I’m skipping all of the what it is stuff, besides to say that it is free form internet radio. We give away all you need to do a live broadcast. But it needs a fully loaded set of audio to play ongoing. 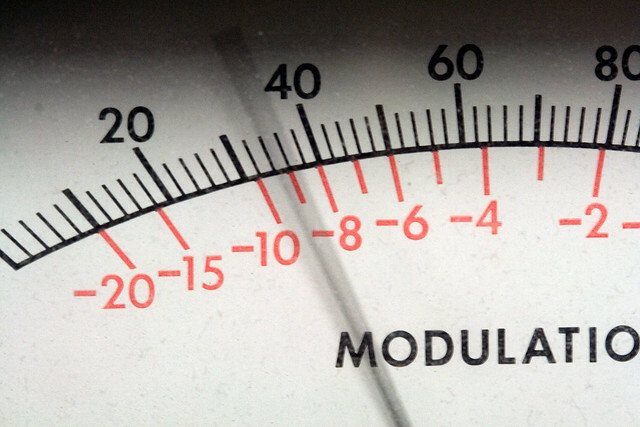 The programmed schedule is what you can hear anytime you tune in. Whatever is programmed can be superseded by a live broadcast. The station software has been through a few iterations and my previous instructions are outdated. Blocks that are yellow are already adopted and managed. The brown ones are generally set for ds106 content. Any other block in white or green can be yours if you want to adopt a spot in the schedule. Setting this up is a bit tedious (long story) so please be flexibly patient- if you want to adopt a two hour slot find one in the schedule and let me know in the comments below. I will likely schedule it to repeat a second day in the week. 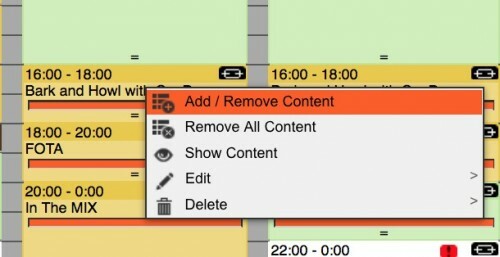 You do not need to be present, show up or do anything except make sure your block is filled (you can tell if the bars in the schedule block are orange). Once you fill, it will repeat each week unless you change it. You should see on the right a block of time corresponding to your schedule (note, I have trouble with Chrome and do not see this right pane, so try Firefox or Safari). 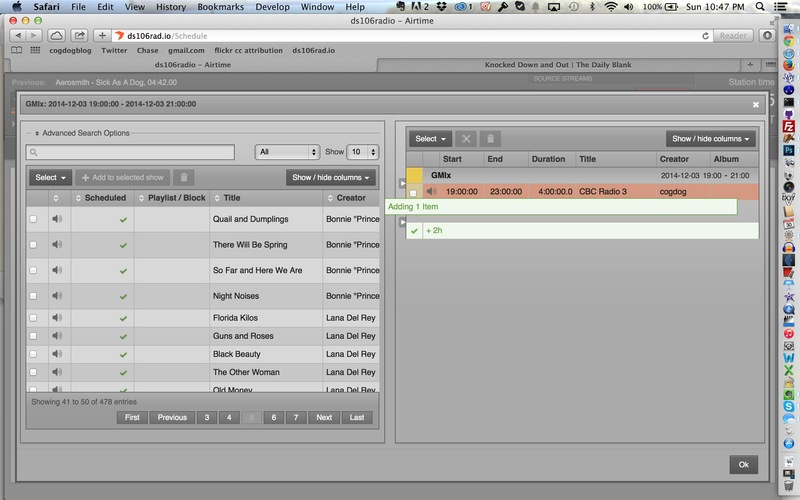 On the left is the media library; you can drag any content from the library into your block. You want to keep adding stuff until the indicator at the bottom is green with a “+” sign indicating you have filled or gone over the time available. 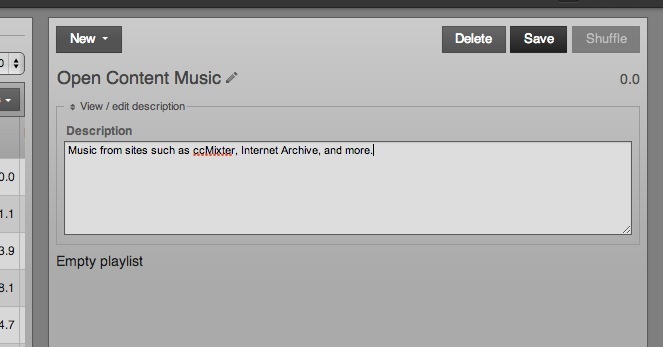 You do not have to upload any content; you can easily fill two hours with items already in the library. 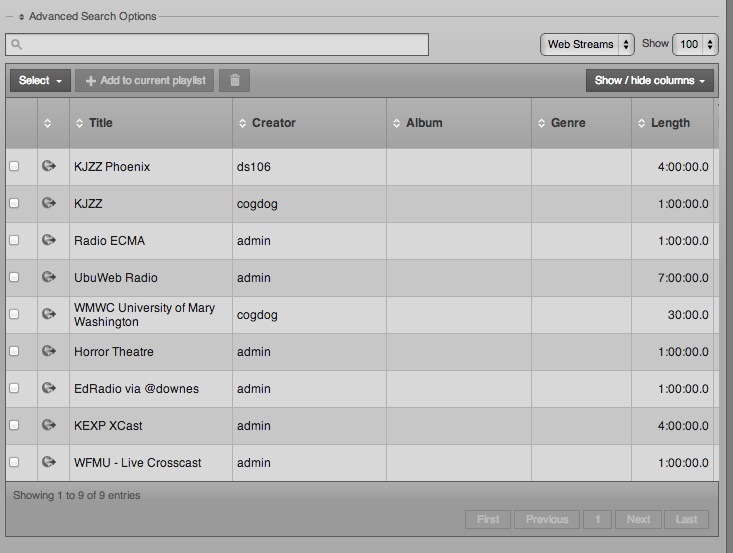 You can just build a show, or you can create a playlist or even a Smart block, or fill your slot with the cross cast of a radio show. I’m rushing this writeup, so am copying below from some previously written posts on creating content. I hope I can explain all of this, but bear in mind, I am only learning by trying. To understand it, get a hold of the Airtime Manuals. 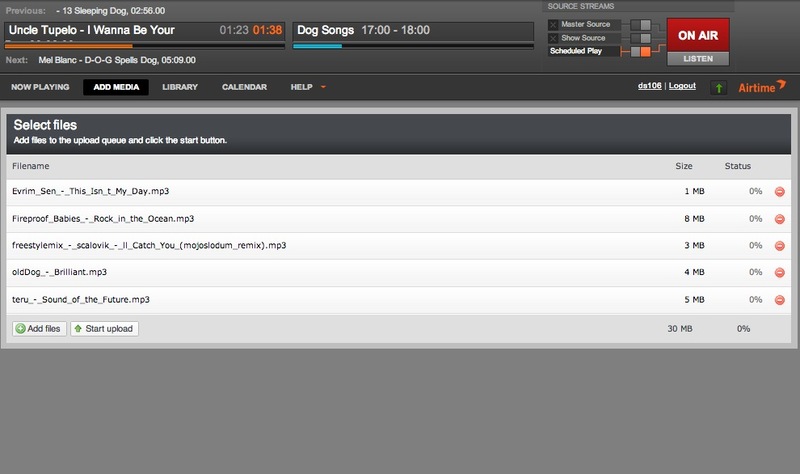 The leap of understanding is that there is first content (audio files) that can be uploaded to the media Library. 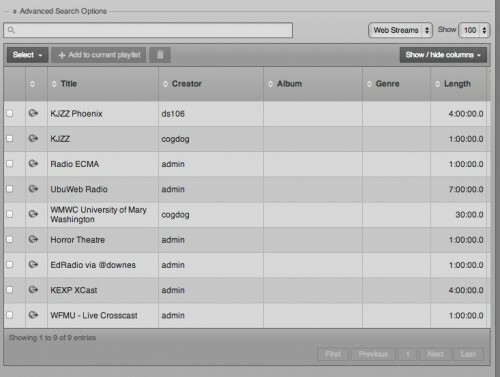 You can also create entries for web stream, URLs for live streams from radio stations (this allows us to easily crosscast). Creating shows is easier if you use playlists to create sets of audio to play. 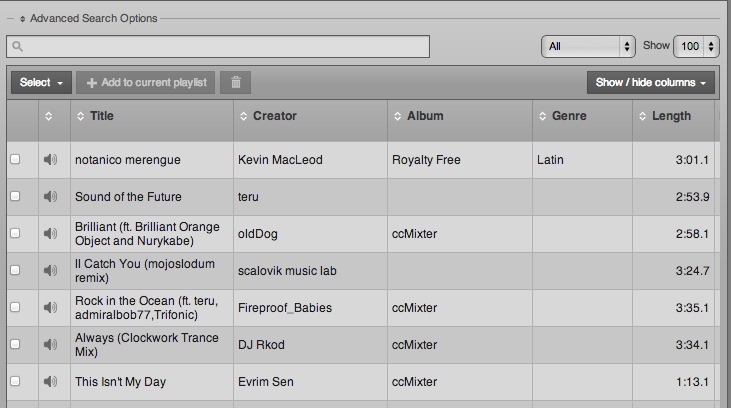 The most familiar is a playlist, where you manually select shows and add/order them. Use the menu on the right pane to create a New Playlist. A description is useful for others to understand what the list is for. 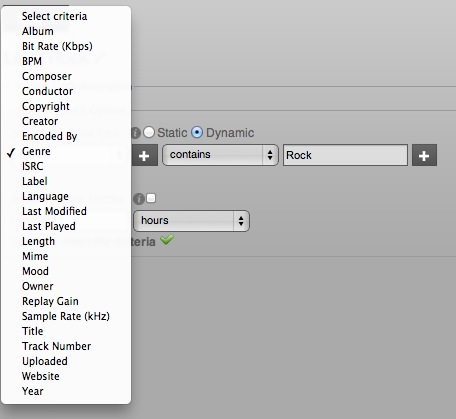 You then go to the Library window, and use the various menus and search tools to find different audio files, which you can add to the Playlist via a button near the top of the Library screen. 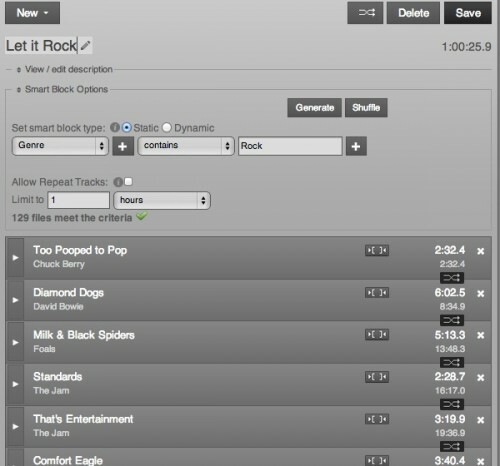 You can re-order and even shuffle the items in a Playlist. 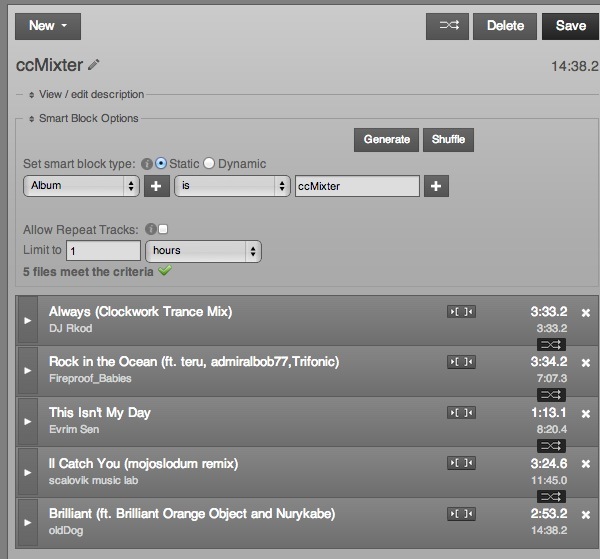 Smart Blocks are a special kind of playlists that are assembled based in criteria rather than manually adding files. For example, with the ones I uploaded, they all have an Album name of “ccMixter”, so I can use that to create a Smart Block- the advantage here is that when I add new media in the future with the same metadata, the show when used will include the newest content. This is a “Static Smart Block” meaning the song order is explicit as listed (or re-arranged); but if you switch the mode to “Dynamic” the list will be updated as content is added to the server that matches the criteria. There are quite a few criteria available to build a smart list. As you change the criteria and change, a static smart block will display what it finds,a good way to test your criteria selections. 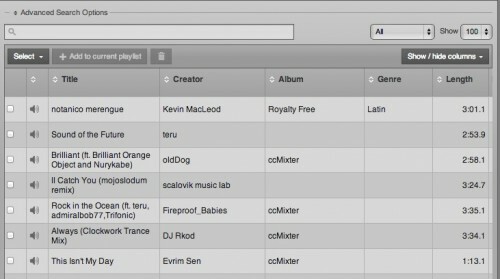 The top of the Airtime interface shows what is currently playing- and the right side shows that there is a broadcast going from “Scheduled Play” (which is the calendar). 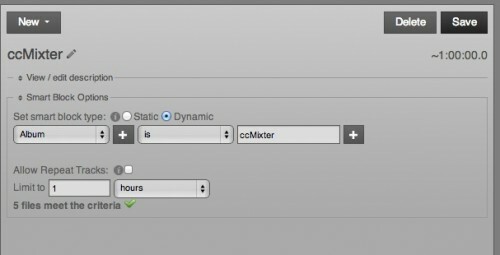 If someone is live broadcasting, the “Master Source” switch is lit up. There is a lot here, and I am not 100% I full explained or understand how Airtime works. 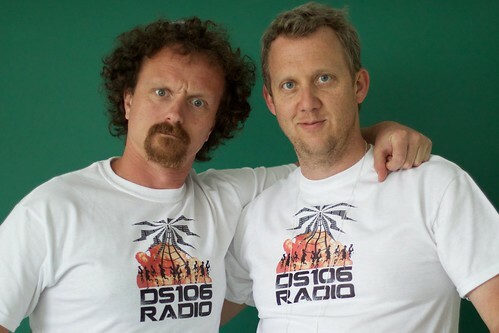 Just remember that radio is fun, but serious fun! Yay! Updated instructions! I would love to be in charge of a block. How about Sunday night 22-24. I’ll take on more later if needed. Forgive me if it is somewhere I have missed, but what timezone is represented on that schedule? In any event, put me down for two hours in that Thursday evening block currently held by WRUR. And depending on the response I could likely do more than that. Doh, I need to add. It’s PST zone on the station. That’s because, in our hearts, the station is in Nelson. I need a block. (ideally something with GMT possibilities). Block me. A voice inside is telling me I need to do this. The voice is outside your head.